Contents: Album Leaf • Arietta • At Your Feet, Op. 68, No. 3 • Ballad, Op. 65, No. 5 • Bell Ringing, Op. 54, No. 6 • Berceuse • Brooklet, Op. 62, No. 4 • Butterfly, Op. 43, No. 1 • Cradle Song, Op. 68, No. 5 • Elegy, Op. 47, No. 7 • Elves' Dance, Op. 12, No. 4 • Erotik, Op. 43, No. 5 • Evening in Mountains, Op. 68 • French Serenade, Op. 62, No. 3 • From Early Years, Op. 65, No. 1 • Gade, Op. 57, No. 2 • Gone, Op. 71, No. 6 • Grandmother's Minuet, Op. 68, No. 2 • Gratitude, Op. 62, No. 2 • Halling, Op. 71, No. 5 • Halling, Op. 47, No. 4 • Home Sickness, Op. 57, No. 6 • Homeward, Op. 62, No. 6 • Illusion, Op. 57, No. 3 • In My Native Country, Op. 43, No. 3 • Little Bird, Op. 43, No. 4 • March of the Trolls, Op. 54, No. 3 • Melancholy, Op. 47, No. 5 • Melancholy Waltz, Op. 68, No. 6 • Melancholy, Op. 65, No. 3 • Melody, Op. 47, No. 3 • National Song • Norwegian March, Op. 54, No. 2 • Norwegian Melody, Op. 12, No. 6 • Notturno, Op. 54, No. 4 • Once Upon a Time, Op. 71, No. 1 • Peace of Woods, Op. 71, No. 4 • Peasant's Song, Op. 65, No. 2 • Phantom, Op. 62, No. 5 • Popular Melody • Puck, Op. 71, No. 3 • Remembrances, Op. 71, No. 7 • Sailor's Song, Op. 68, No. 1 • Salon, Op. 65, No. 4 • Scherzo, Op. 54, No. 5 • Secret, Op. 57, No. 4 • She Dances, Op. 57, No. 5 • Shepherd's Boy, Op.54, No. 1 • Solitary Traveller, Op. 43, No. 2 • Song of the Watchman • To Spring (An Den Fruhling), Op. 43, No. 6 • Spring Dance • Summer Evening, Op. 71, No. 2 • Sylph, Op. 62, No. 1 • Valse-Impromptu, Op. 47 • Vanished Days, Op. 57, No. 1 • Waltz, Op. 12, No. 2 • Waltz, Op. 38, No. 7 • Wedding Day at Troldhaugen, Op. 65, No. 6. If you're looking for something beautiful and different to play, this is it. 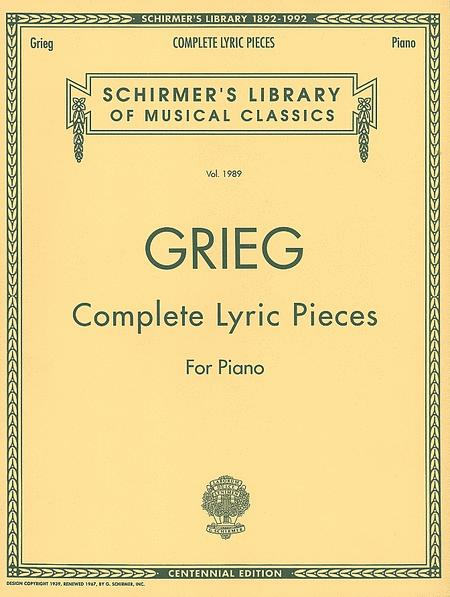 This collection contains many of Grieg's most beautiful melodies. You might want to get started with Notturno or Erotik. Notated fingerings greatly facilitate interpretations. 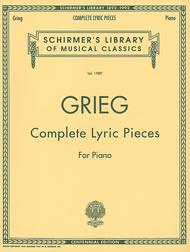 This book contains all the Lyric Pieces, some quite difficult, very beautiful and true to the spirit of Grieg. Wedding Day at Troldauen is a beauty. is a fairly thick book and it's hard to keep it opened to the page you want without it closing because of its binding. I personally cannot play it, but a family friend can and it is so amazing just to watch. My goal in life is to master this. The beginning is my favorite part.